Proposed benefits packages for areas around fracking sites would "go nowhere near compensating" those affected, a Lancashire campaign group has said. Shale gas drilling areas will get £100,000 in "community benefits" and 1% of revenues, under new guidelines. Defend Lytham's Mike Hill said the package would "pay for only a fraction of the loss suffered by homeowners". 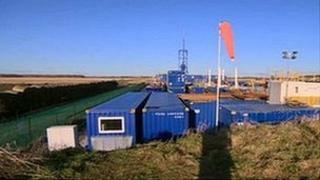 Cuadrilla Resources, which has licences to test for gas in the county, said it could "amount to millions per site". The new guidelines, issued by the Department of Energy and Climate Change, came following a survey by the British Geological Survey of the potential volume of shale gas in the Bowland Basin. It found the basin, which stretches under Cheshire, Lancashire, Greater Manchester, Merseyside and Yorkshire, held an estimated 1,300 trillion cubic feet of shale gas - double previous estimates. Up to 10% of the gas could be extracted by fracking, a technique where water and chemicals are pumped into shale rock at high pressure to extract gas. Energy Minister Michael Fallon said the benefits would "provide a welcome boost for communities who will host shale exploration and production, as well as offering strong assurances that operators will engage with them and work to the highest health, safety and environmental standards". "From money off bills, playgrounds, sports halls or regeneration schemes, people will see real and local advantages from shale gas production in their area," he added. Mr Hill, whose group works to preserve the "special character" of Lytham and St Annes, said residents were "concerned on two counts". "Firstly, the level of benefit proposed would go nowhere near compensating local homeowners for the level of financial loss that they might suffer as a result of fracking. "Secondly, it is unclear what is meant by community. "We understand that these sums might be paid at the county council level, so there is no guarantee that funds would even end up being directed at the communities who are affected." Lytham lies alongside one of four Cuadrilla's sites in the county, though the company have suspended all drilling in Lancashire until 2014. Chief executive Francis Egan said the company "support the community benefits scheme". "Cuadrilla will commit to local communities 1% of the revenues from each producing site during the production phase. "With success, this should amount to millions of pounds per individual production site, benefiting local communities."